The Sarjeant Gallery’s collection is multi-layered and worth much more than the fluctuations of fashion and market trends. The layers contain a priceless visual record of aspects of Whanganui’s history, the social fabric and tastes of the community that the Gallery served. 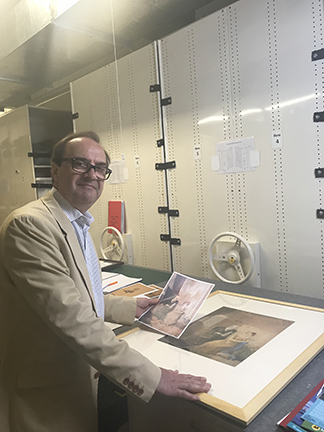 So when Nick Lambourn, Head of Department, Topographical Pictures of Christie’s auction house in London paid a recent visit it was for a purpose that only the Sarjeant could help him with. 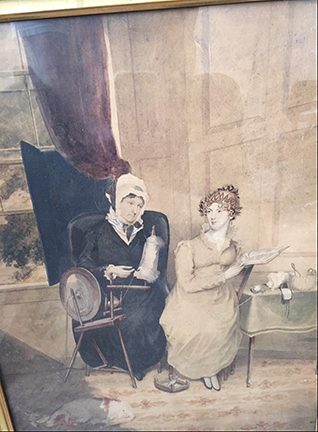 Mr Lambourn was researching a painting by John Alexander Gilfillan that will be included in Christie’s annual topographical auction later this year. Topographical art is work done by artists in countries outside Europe. 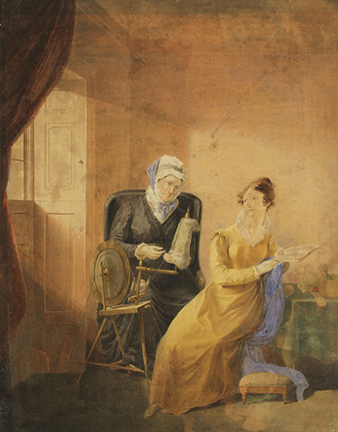 Christie’s Gilfillan water colour of two women spinning fabric by a window is almost identical to that held by the Sarjeant. Mr Lambourn wanted to compare the paintings to determine the identity of the women. “It’s rather intriguing because we think it’s a portrait of Gilfillan’s mother and, in the one you’ve got here, of his first wife [Sarah Murray]. We are wondering whether it’s his second wife he has painted in a second version of the same composition or another version of his first wife. We are trying to work out that puzzle,” Mr Lambourn said. John Gilfillan was an itinerant artist who worked in Australia and New Zealand after teaching art in Scotland. In 1845 he began to farm at Matarawa, and near Putiki Pa, became friendly with local Maori and made many drawings. In 1847 young marauding Maori travelling through the district killed his wife and four children and seriously injured Gilfillan and his eldest daughter who later resettled in Australia. The temporary storage is an indication of what storage in the redeveloped building will be like said Ms Taylor-Moore. “It will be bigger with more racks and will allow room for more growth. We are a bit cramped here.” Larger, improved storage space already allows her to show people around the collection store, which they were unable to do in the building on Queen’s Park because of hazards. This will improve when the collection is housed again in its rightful place. But for the Sarjeant keeping up to date with market values is more useful for insurance purposes. “There is a three yearly revaluation of the collection to ensure that we are adequately covered,” said Ms Taylor-Moore. Footnote: Christie’s was founded in 1766 by James Christie. He held a sale in his “Great Rooms” on London’s Pall Mall. His first auction included a pair of sheets, two pillowcases, two chamber pots and four Indian glassworks. The following year, he held the first of many future auctions that were devoted entirely to pictures. The auction house has records of every sale, seller and buyer. Items sold by Christie’s have stenciled references on the back and the records can be accessed through Christie’s archive.